The Classic Racing collection, therefore, welcomes three new and very special Superfast models that constitute a further step towards independence so much that is dear to Chopard. 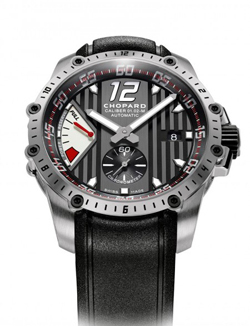 For several years now, Chopard is faithful partner of the legendary racing classic cars like the Grand Prix de Monaco Historique and the Mille Miglia. The second competition sees lined up on the starting blocks cars that have marked their era – Alfa Romeo, Maserati, Porsche and Ferrari – while the former also refers to the Formula 1 cars built before 1979, Brabham, Lotus and Williams in the head. Superfast models are large watches that exhibit a decidedly masculine design. From now move through Gauges manufactured in-house and which bear a particular decoration. Of course in the three new Superfast there are references to the racing world, starting with the dial which exhibits an anthracite-colored vertical stripes decoration on a black background, to remember the famous “racing stripes”, the colored bands affixed to the hood and roof of the cars to distinguish between them. On the flange of the new Superfast, the numbers of minutes adopt the graphics of the rev counter and speed indicators of vintage cars. Similarly, counters, hours, minute and second hands take up the dashboard of racing cars of those years. The natural rubber strap with steel folding clasp gives the slick slick tires: an immediate reference to Formula 1. There are many other elements that recall the racing wheel as the steering wheel racing on rubber-molded crown in gold, the surface finishing engraved on the sides of the loops, the buttons that appear cooling fins, the Allen screws on the bezel inspired to those of the circles. Even the gauges have benefited from special care. All bridges were perforated to create thin parallel lines, just like the fins of the radiator grilles in the cars of the past. Finishing a novel that can be admired through the sapphire open. The new Superfast Automatic offers the functions of hours, minutes, seconds and date in a window at 6 o’clock and is equipped with automatic winding caliber Chopard 01.01-M, entirely designed, developed and manufactured in the workshops of Fleurier Ebauches. The watch is chronometer-certified by the COSC and provides a power reserve of 60 hours the stainless steel case of 41 mm diameter is water resistant to 100 meters. Another version of this movement has been inserted in the model Superfast Power Control. Baptized Chopard 2.1-M, this evolution of the previous Caliber indicates the hours, minutes, small seconds at 6 o’clock, date display in a window at 3 o’clock and the power reserve in an area of the dial at 9 o’clock . The stainless steel case, bigger, measuring a diameter of 45 mm. The Superfast Chronograph, equally determined and equipped himself with a case of 45 mm in diameter. Mount the gauge Chopard 03.05-M, a mechanical self-winding movement with hours, minutes, small seconds at 6 o’clock, calendar window at 4:30, engraved tachymeter scale on the bezel, chronograph with central seconds hand, minute counter at 3 o’clock and 9 o’clock. These movements Chopard inserted for the first time in the models of the collection Classic Racing have been realized in the laboratories of Fleurier Ebauches. The companies belonging to the group Chopard was founded in July 2008 in Fleurier, in the Val-de-Travers (Neuchatel). A few months before the birth of the company in December 2007, Chopard had acquired a plot of 6,000 m2 on which stood an industrial building with a capacity of 5,100 m2 of production area. The building was inaugurated in February 2009. 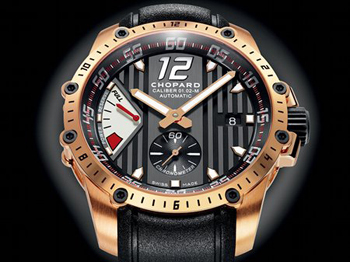 In 1996, the group had created Chopard Manufacture. This company, located not far from Fleurier Ebauches, is the center of Haute Horlogerie dedicated to developing, manufacturing and assembly of gauges LUC Today, the Group Chopard in Fleurier employs approximately one hundred and sixty persons employed to carry out fifteen crafts.